This oceanfront condo with a million dollar view has just had a $100,000 dollar remodel completed in 2008. It has a gorgeous Great Room and a beautiful fully equipped kitchen. With the roar of the ocean just a few yards away, you will not want to leave the Lanai after relaxing on the Tropitone furniture. A beautiful little sandy beach is right in front of your Lanai. This is rare on the Big Island. There are also plenty of "World Famous Beaches" just a few miles away. The Best Snorkeling in the world is on the Kona Coast. This is a spectacular property designed by award winning architect VLADIMIR OSSIPOFF. It incorporates many features that are his trademark, such as screened full-length louvers throughout to provide flow-through ventilation, a large open lanai, and sliding glass doors and screens that completely hide in a pocket leaving the entire kitchen and great room open to the Lanai. This is a private complex with only six units. It is about 2 miles to the center of Kailua-Kona Village. The Big Island is huge, in fact all the other islands together could fit on it. There is so much to do. You are about 1/4 mile from the open-air Ali'i Gardens Marketplace,where you can browse for local produce, coffee, macnuts,and souvenirs. Location! Location! Location! We are right on a beautiful small sandy beach with tide pools full of fishes, turtles and gorgeous sparkling water. It is great to look at all day and so much fun for the kids. The sunsets are also spectacular. No crowds because the beach access for the public is about 1/4 mile away across Lava. You can sit on the Lanai and see spinner dolphins go by all year and whales when they are in season. If you are looking for Beautiful, this is it. Reserve this unit now. 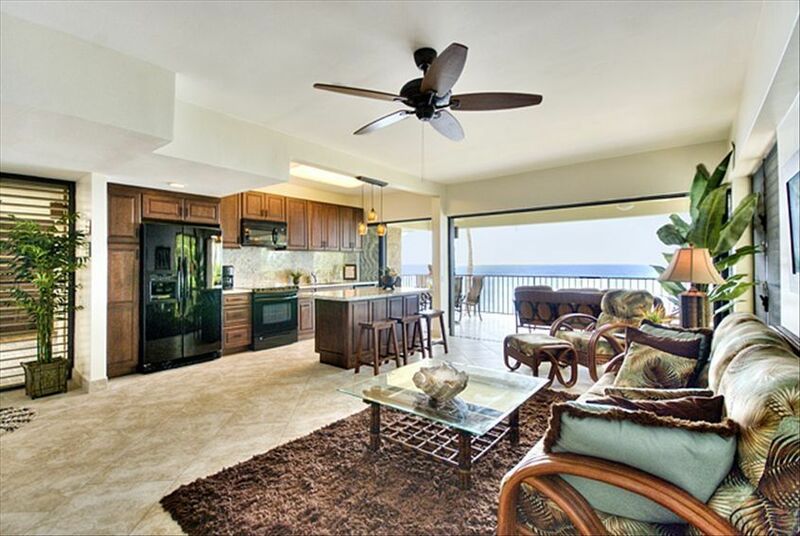 Gorgeous oceanfront with access to a small sandy beach which is very rare in Kailua Kona. All are new and there are protective covers on the pillows and mattress's. New side by side with ice-maker and portable ice bucket. Beautiful top of the line appliances, granite counters, great dishes, etc. This is a nice solar-heated pool, lots of shade, right on the oceanfront. Best Location! Best View! Amazing Condo!! Don’t miss a stay here...didn’t want to leave!!! Snorkeling everywhere you can (especially around Cook’s monument/ the Bay), malasadas (Portuguese doughnuts in Punalu’u Bakeshop), black sand beach, Hilo, Hāpuna beach, Captain Cook roadside market, Kona ice, Hawaiian cheeseburgers...list goes on! Aloha, friends! As so many others have stated, the view is the best part of this beautiful condo. The beds were so comfortable and the linens were the high thread count type that feel like silk. Loads of provided amenities. The tidal pools right in front of the condo are full of colorful fish and even eels. I would stay here again in a heartbeat in spite of the minor drawbacks. I'm only 5 ft 1, the cupboards must have been designed for NBA players. The microwave was so far above my head I had to use the provided step stool to get my coffee cup if it stopped at the back. The coffee table is a knee or shin hazard. We moved it after we all bumped into it, and rearranged a few things for more comfortable tv viewing to catch the news in the morning. Not much seating for 4, 3 must sit on the couch and look to the far left to see the tv, but we didnt watch much. We also would have loved to had a 2nd table inside, as the stools were not comfortable for very long.The late afternoon sun is intense outside. The neighbors all seemed to have blinds for that, and we met a couple of them and they were so friendly and helpful. The location is wonderful, we so enjoyed the big island, and we would stay here again! It has a lot more positives then negatives. Great location and overall amenities. Thanks again for a great stay in HI. Condo was just as advertised, great location and accommodations. Only feedback for improvement is the left hand sliding glass door needs some lube to eliminate a very high pitched squeel as it closes and the main door sliding screens need some TLC improvements. Very minor given the beautiful setting, location and overall amenities. Would stay again. Thank you. Thank you so much for your feedback. I'm glad that you enjoyed your stay at Hale Pohaku. I'm sorry about the sliding door- it will definitely be fixed. I look forward to your return stay at our condo. Beautiful sunsets in a lovely condo. Throughly enjoyed our stay in this lovely condo. Great views and a terrific pool. Very gracious and accommodating owner. Thanks for a wonderful time. Sitting on the lanai was our favourite part of our stay. We saw turtles, dolphins, and a couple of whale spouts (it was early in the whale season) and gorgeous sunsets. The condo was comfortable, nice breezes with the windows open. The beds were comfortable (very important to me). The kitchen was well stocked including many condiments, spices, oils. We had two glorious weeks here! Great location, convenient to town and beaches. Nice place for a morning run and a relaxing evening.